Why are the fire service changes being proposed? Fire protection in the Yellowpoint Waterloo Fire Protection Service area is currently provided under contract with the Cowichan Valley Regional District through its North Oyster Volunteer Fire Department. Over the course of the last two years an examination of requests for changes to bring all properties within 8 kms response distance of a firehall and the long term requirements of the North Oyster Fire Department resulted in a decision to make a number of boundary changes. A portion of the service area is proposed to be amalgamated with the Cranberry Fire District. Equipment located at the firehall station on Hallberg Rd. does not belong to the Regional District of Nanaimo and will be returned to the North Oyster Fire Department on January 1, 2009. Approval of Bylaw 1549 would provide a budget sufficient to purchase two vehicles and replacement gear and equipment for volunteers who would report to the firehall. The firehall would be operated by the Cranberry Fire District. Qualified residents in parts of Electoral Areas A and C will be able to vote in this referendum. 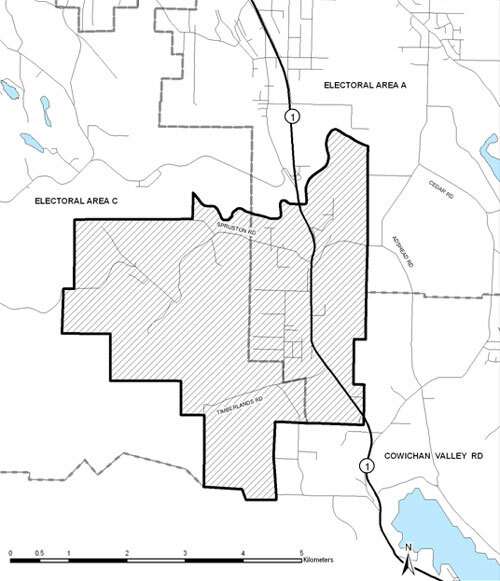 The Regional District would levy a parcel tax to cover the cost of repaying the borrowing under Bylaw 1549. This is estimated at $91 per property per year. If the boundaries of the Cranberry Fire District are approved to be expanded, property owners would pay a fire protection service tax to the Cranberry Fire District. For properties valued at $100, 000, this tax would be $64. Total annual fire protection costs for properties valued at $100,000 in the affected service area would be approximately $155,000, compared with an estimated cost of $164 with continued service from the North Oyster Fire Department.